He’s back, the daring pulp avenger from Atlanta, Ga., in six new, thrilling tales of mystery and mayhem. 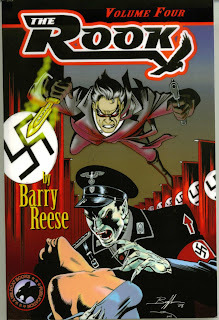 Keeping with his horror themed exploits, Reese pits the ever stalwart Max Davies and his allies against a group of Nazis vampires, a long dead pirate ghost and an old enemy who crosses paths with the Frankenstein monster. Each of these stories is filled with colorful classic pulp heroes such as the Black Bat and Domino Lady, to their arch enemies like the red-garbed Doctor Satan. The real fun is how Reese adds to this melodramatic stage his own creations starting with the Rook and then including such iconic figures as a Russian-style Doc Savage and a female version of the Phantom all without skipping a beat. When reading these books, it’s a real joy to see old nemesis’s return time and time again like the Warlike Manchu, who at one time had been Max’s mentor. When he revealed his true villainous nature and attempted to recruit the hero to his world conquering cause, it immediately launched a furious war between the two. And like all true pulps, even death cannot stop these monsters from coming back time and time again. So why does the Rook do it? Why does he constantly put his life, and those of his family and friends, in jeopardy? Because, like all true heroes, he has no other choice. His soul has been cast in a timeworn mold of nobility and courage, he is a defender of the weak and the powerless and on many occasions, all that stands between the world and total destruction. Tired, weary, scarred and haunted, he presses on, fighting the good, but never ending fight and in the process delivering these amazing, fun-filled page turners that are not to be missed. Reese and the Rook are now four for four and that’s saying a lot. We can’t wait to see what Volume Five will bring. When Edgar Rice Burroughs wrote his interplanetary adventure back in the early days of the 20th century, knowledge of our solar system and the planets that made it up was limited. Most scientist of the time subscribed to the theories of astronomer Percival Lowell who speculated that Mars had at one time been vibrant with life much like our own Earth. He believed that over a period of millions of years Mars’ oceans had receded turning the planet’s surface into an arid, dying landscape. Lowell also speculated that the supposed Martians had built canals thousands of miles long to bring water from the polar caps to irrigate the remaining arable land. Such fanciful visions of the Red Planet would have clearly fueled Burroughs imagination and in 1911, at the age of 35, he began writing the exploits of a unique ex-Confederate officer named John Carter. Carter, while prospecting for gold in the Arizona desert, dies and his spirit is magically transported to the dying planet of Mars where he is given a second life; one of fantastic adventures among the varied races of Mars. Burroughs imagined two distinct intelligent races vying for control of the world they called Barsoom. The first of these that Carter confronts are the green men, standing an average of eight feet tall, possessing four arms and having huge tusks and bug-like eyes. Among these humanoids, Carter allies himself with the mighty warlord, Tars Tarkas and the soft hearted female, Sola. It is Tars and his clan who indoctrinate him into the savage society he has miraculously stumbled upon. No sooner does the ex-soldier learn the Martian tongue and the ways of the green men, then he meets the more human-like red men, who are identical to Earthlings save for their deep red coloring. Among these, Carter meets the beautiful Dejah Thoris, Princess of Helium, one of the major principalities of the red men. The two quickly fall in love and Carter pledges his life to saving her from the green men and returning her safely to her people. A PRINCESS OF MARS is by no means a science fiction novel, although it has been labeled such ever since its debut in All-Story Magazine Feb. 1912. It is a planetary romance, which is more a fantasy and usually includes lots of sword fighting and swashbuckling activity. I first encountered this book and its sequels as a teen-ager, which is when most readers generally discover Burroughs’ works. At that time I saw a great deal of romantic chivalry imbued throughout these Barsoomian tales, wherein Carter was a noble warrior who lived by a strict code of honor reminiscent of medieval knights. They are still lots of fun to read even though modern astronomy has long since dispelled most of the Red Planet’s mysteries. Robotic Rovers have found no evidence of ancient civilizations of any hue. Still, the fantasy those adventures weave still entertain. It was by sheer coincidence that at the same time I was rediscovering Burrough’s antiquated romances, that James Cameron’s block-buster science fiction film AVATAR exploded on the cinematic scene. Sitting in an I-Max theater, watching this wholesale creation of the alien world of Pandora, I couldn’t help but think of Burrough’s Barsoom and smile. Cameron and Burroughs are souls cut from the same cloth, dreamers who looked at the heavens and were not content with the limits of science. They both dared to venture beyond and wonder what if? 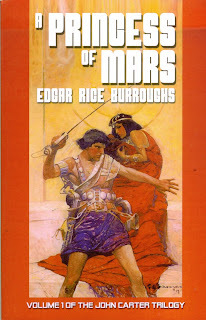 A PRINCESS OF MARS is a classic well worth revisiting. Kudos to publisher Van Plexico for releasing these new, wonderful designed editions from White Rocket Books. 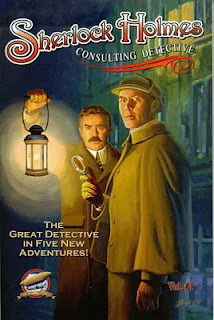 Sherlock Holmes – Consulting Detective. Vol. One. This anthology consists of five new tales, each followed by an author’s commentary, and an Afterward by the editor, Ron Fortier. The first tale, The Massachusetts Affair,” is a novella by Aaron Smith that suffers from an excess of Americanisms, both in language and in viewpoint. This is somewhat eased because most of the principal characters are American, but it is still quite noticable as it opens the book. The mechanics of the tale are difficult to accept, but the characters are believable and Holmes and Watson are relatively comfortable presences. The second tale, “The Problem at Stamford Bridge,” is another novella, this time by Van Allen Plexico. It introduces Dr. Watson and the audience to the world of professional Soccer in late Victorian England. Unfortunately, that world shares many traits with professional sports in the 21st Century, which include felonies, player violence and professional jealousy. I suspect the same was true of the gladiators in the Roman Coliseum. Sherlock Holmes manages to adapt himself seamlessly into the milieu and comes up with the proper solutions while Dr. Watson plays his ususal ‘catch-up’ game. The third tale, “The Adventure of the Locked Room,” is another novella, this time by Andrew Salmon. There is some confusion about the timing of this tale as it is supposed to occur after “A Study in Scarlet” but only a fortnight or so after Holmes and Watson move into the rooms in Baker St.. If the timing factor is ignored, this becomes an interesting little mystery, with a couple of neat twists. Further, the door is left open for additional complexities in future, so this is a reasonably satisfying visit to our old friends in their new abode. The fourth tale, “The Adventure of the Tuvan Delegate,” is a long short story that involves additional Sherlockian characters, Mycroft Holmes and Professor Moriarty. Take one peace conference in London, add the Professor causing trouble, mix in Mycroft trying to keep order, Sherlock investigating an apparently unrelated event and stir well. The result is written here. This is an amusing tale, full of action and adventure, with little deduction and not much mystery. The final tale, “Dead Man’s Manuscript,” is a novella by I. A. Watson. It contains enough mystery and exotic background for any Holmes tale as well as several well-drawn supporting cast. It is a classic mystery, with all needed clues included but obscured and it is a ‘fun’ read. Dr. Watson exhibits his better qualities, Holmes astounds his audiences and all’s right with the world, even if villains are about their business. The “Vol. #1” designation on this book declares the publisher’s intent to follow with more of the same (or better?). A sequel may be worth looking for. Having majored in Business Administration while in college, I know just how dry and boring subjects like Economics and Financing can be, which is why finding a modern day pulp thriller set in World War II and dealing with a group of young bankers out to save the world from fascism was a marvelous surprise. Even more so that it works extremely well. In the early 30s a group of idealist young men and women, six in all, join forces at the University of Berkeley to hypothesize a new economic theory they call the Power Cycle. It is their idea that leading world industrialists are shaping social events and becoming the true powers behind international governments, including Germany. The six, all heirs to wealthy banking families, decide to become an economic watch group and call themselves the Sentinels. Their primary mission, to recognize large monetary shifts indicative of an emerging Power Cycles and then disrupt them using applied banking practices. Practices they tweak via illegal forgeries to stymie their opponents. This charismatic group is led by Frenchmen Jacques Roth and American Mike Stone. As the war wages in Europe, it comes as no surprise to the Sentinels when they discover that the same German Industrialist who helped manipulate the birth of the Third Reich, are attempting to funnel their personal wealth out of the country in order to ensure it’s safety should Germany lose. The implied threat to the Sentinels is all too real. By protecting their lucrative assets, these men could easily launch a new Reich from the ashes of the old. The Sentinels are not about to let that happen and begin devising a scheme to steal the money from them. 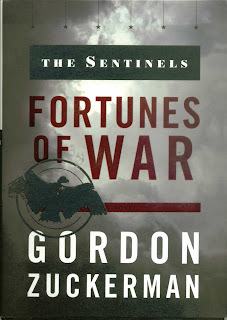 Part spy thriller, part social-economic dissertation, FORTUNES OF WAR is a captivating new twist on the modern thriller. Not since Ian Fleming’s early James Bond books has there been such a deft handling of real world settings married to a group of daring-do heroes. The Sentinels are all well defined and make a great team. This is modern pulp at its finest and I can’t wait for the next Sentinels adventure.